Yo! It’s CK and I’m here to tell you how you can help your pet lose weight and save your relationship. Your relationship with your pet, that is. I ain’t no Dear Abby! I’m going to share some Before and After pics that should get your attention. It’s time to stop denying Fido or Fluffy might have a weight problem. When the peeps first brought Autumn into their house, she was a little round ball of a cat. She had been TW’s Mom’s cat. Gramma used to tell TW that Autumn was a “dud” because she never played. Her nickname was “Plumpy." Gramma’s intentions were good; but, because she was in her late 70’s when she adopted Autumn, she didn’t have the energy to play with her. Autumn became lazy. She was the equivalent of a human couch potato. Once TW adopted her, she changed Autumn's diet and set up a daily exercise time for her. Every day, she’d come home from work and get out the feather wand toy. Every day, Autumn would jump and play for the entire 20-30 minute play time. Did I mention she’d also purr the entire time. Autumn was definitely not a dud. She loved to play and was so much happier. 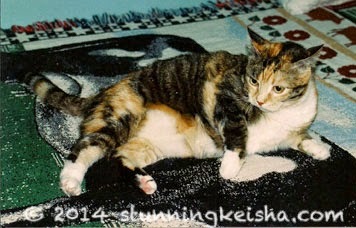 Autumn was a slender cat trapped in the body of a flabby tabby. Today, a little over 50% of the pet population is overweight, which can lead to serious health problems. Hill’s® Prescription Diet® Metabolic Advanced Weight Solution can help make losing weigh easier for you and your cat or dog. You don’t need to change the way you feed your pet; you just need to change WHAT you feed him or her. The Metabolic Advanced Weight Solution arsenal includes wet and dry food, as well as treats, for both cats and dogs. I made a little slide show for you to illustrate some of the dramatic weight loss in cats using this program. 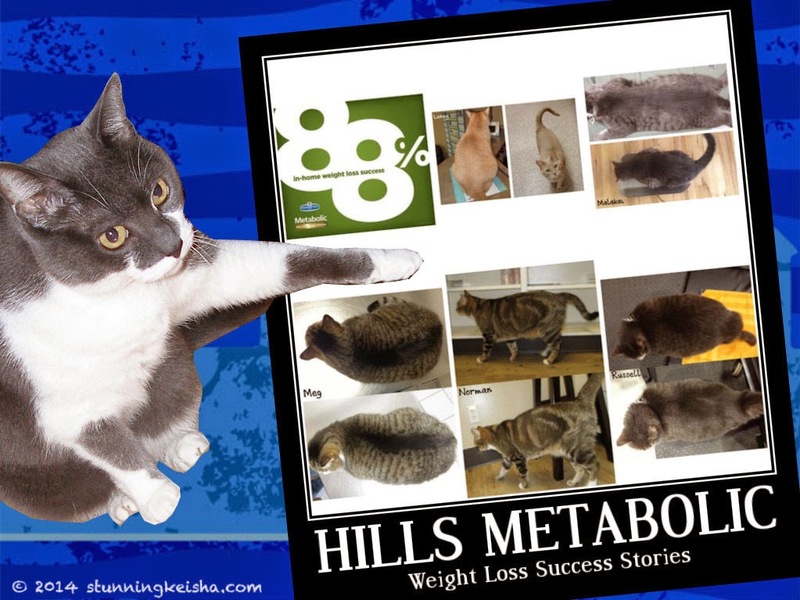 These are actual cats who used Hill’s® Prescription Diet® Metabolic Advanced Weight Solution in their own homes. All photos courtesy of Hills. When the good folks at Hill’s approached me to blog about this new Prescription Diet, my first question as a cat was: what exactly is a metabolism and do I have one. TW always says hers is super slow. The dictionary says its the chemical processes that occur within a living organism in order to maintain life. Simply defined: Metabolism converts the fuel in the food we eat into the energy needed to power everything we do. Now we should all be able to follow along. Now that we know that, we can proceed to some key points about this advanced prescription diet. The following video is a real life story of a dog named Bear and how his excess weight affected his life and his relationship with his family. As you can see from the video and from the peep’s experience with Autumn, a cat or dog’s weight can affect the relationship between pets and pet parents and potentially shorten the length of that relationship. Instead of losing Bear ahead of his time, his human gained a friend to play with and take walks with. Both pet and pet parent benefited. If your pet is looking a little—or a lot—rounder around the middle, talk to your vet about Hill’s® Prescription Diet® Metabolic Advanced Weight Solution. It’s a safe, effective, and fast way to lose weight and to maintain that weight loss. 88% of pets lost weight in 60 days at home. Don’t take my word for it; watch the video and look at the before and after pics in the slide show. Bear’s dad gained a friend. That’s why it’s so important for pets to be at their ideal weight. This post is sponsored by Hill’s through the BlogPaws Blogger Network. I am being compensated for helping spread the word about Hill’s Prescription Diet Metabolic Food, but Stunning Keisha only shares information I feel is relevant to my readers. Hill’s Pet Nutrition, Inc. is not responsible for the content of this article. That video was very nice. I'm glad the man got his friend back. BOL BOL CK flabby tabby. We are going to do some keep fit today down in our park. Have a fabulous Friday. Your posts are always so creative, CK! We enjoy hearing more about Autumn. I agree, CK, your posts are always incredibly creative! 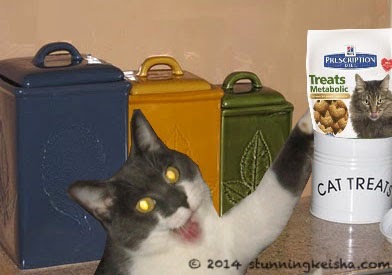 I just love that last pix of you grabbing the treats! Autumn was beautiful and I am so glad TW was able to make her happier and healthier! Same as some others have said. CK, your posts are creative, enjoyable and informative and yes...often very funny. Glad to call you my BFGF. My Mom needs to talk with TW about the BP Network. Great video and informative post CK! Thanks for sharing!!! And thanks for linking up with us! How wonderful that Bear lost the weight and gained his life back. That's very touching. ...and you've done a wonderful job on this clever post too, Miss CK! Hey CK, you did a great job explaining this food and why it's important to be a healthy weight. Love Autumn's story and how she wasn't a dud! nice two meet ewe autumn....yur coat ROCKS !!! N way happee bear getted hiz weights off....kewl pup...german shepherd ??? Great info CK! You mean sisters aren't supposed to be round? Another excellent job CK. I'm loving your graphics in addition to your sales job. I'm sold. Oh wait - I'm already on the program so I don't qualify. It's a good program and I've been successful on it. Great review, CK. That sounds like some good food for the pudgy cat. We hope we never have to use it, though. Hi Cousin--very good information. I am of course at the perfect weight but I will tell some of my furrends about this interesting food. Of course, we iz the perfect weight. Buts, we will share thiz for some overweight kitties!!!!! That was a great post, CK! You presented the information in an informative and engaging manner. That video was wonderful -- we're so glad that Bear was able to lose that weight. What a great post CK! Yous is a professional! Me is not overweight and neither is any of the other pets, but our Mommy...lets just say she is almost twice the size she should bes!